With Christmas and New Years approaching I thought it was the perfect time to treat myself to some new lipsticks to broaden my collection for when the next couple of weeks during the festive season. I couldn't help myself and had to pop into Mecca and Kit Cosmetic store. To try something different and to be a little more daring I thought i'd pick up a deeper colour. This specific deep wine coloured lipstick from Kit ( called Go deeper) is just the colour that I was looking It didn't doesn't wash me out or is to bright for my fair skin colour. It's a deep rich sheer colour that is quite hydrating and it has a long lasting formula. This specific deep mulled wine like lip colour is perfect for people that have fair skin and hair and want to try something a little more daring. I know choosing bright lipstick doesn't always suit blonde haired people. I definitely think that this lipstick will be my new go to lip colour for going out! For a while now I've been looking for an everyday lip colour that wasn't to pink or orangey and that is also moisturising not leaving that cracked lipstick look behind. Finally I found the shade that I had been looking for, for some time now. The Smashbox Melondrama lipstick is the perfect everyday coral like lipstick (at least for me) and I did feel like doing a little mini dance in the shop when I saw it. I'm not entirely sure yet if its hydrating enough, but it definitely is really pigmented making it quite long lasting, I maybe had to apply it once more during the day. 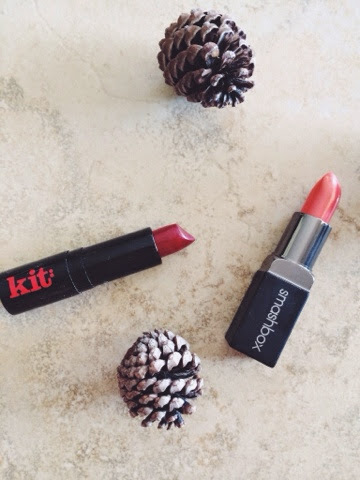 I hope you enjoyed this post, let me know what your favourite lip colours are!